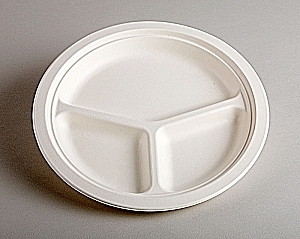 Whether it is everyday dinner with the family or it is the annual neighborhood barbeque, these three partitioned disposable plates really are the smart choice. The 3 compartments keep everything in the proper place. There is no food touching. They are made from a natural by-product called Bagasse (sugar cane fiber) and are fully biodegradable and compostable. Sugarcane plates are perfect for preparation and preservation as well because they are microwave and freezer safe. You won't want to be without these disposable plates on camping trips or at picnics. All hot and cold foods!